Very nice flared denim skirt from Per Una, size 18. 4 panels front and back. Front zip fastening with brass effect button. 2 slant pockets with false tab and small brass effect button feature. 2" shaped waistband with belt hooks. Per Una Ladies Top Size 14. Condition is Used. Dispatched with Royal Mail 2nd Class. Very good condition. Chest 55cm armpit to armpit, neck to hem 61cm. Very light weight. Per una Size 14 Waterfall Summer Cardigan. Condition is Used. Dispatched with Royal Mail 2nd Class. womens per una denim skirt size 18. Condition is New without tags. Zip front opening, Dispatched with Royal Mail 2nd Class. M/S Per Una Ladies Jeans Size12. Condition is Used. Dispatched with Royal Mail 2nd Class. Condition is Used. M ai n co lo ur s cr ea m an d bl ue. Per Una Blue & White Linen Mix Dress 16. Condition is Used. Dispatched with Royal Mail 2nd Class. Lovely dress beading round pattern at the hem. Side zip, side pockets. Hem has been adjusted. Small mark near hem on one side. See photos. Reflected in the price. See other items. Will combine postage if possible. 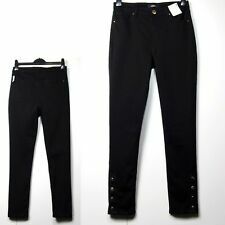 Per Una M&S Ladies Dark Blue Straight Leg Jeans, Size 12M. Condition is Used. Dispatched with Royal Mail 2nd Class. These lovely trousers are a the green as seen in the close up of the Per Una label not mint green as they appear in the other pictures. They have a slight stretch and a sheen to the cotton. A fine knit ?. cotton blend cropped cardigan from Per Una in what I think is a 16/18 (the label has been removed). It has short sleeves and is in good condition. From Per Una. Fabric: 58% linen, 20% viscose, 20% polyester, 2% elastane - machine washable. This smart dress shades from stone to grey. Smart Linen-blend Pencil Dress. Length shoulder to hem: 38". Lovely M&S Per Una Dress Size 12 Reg Grey and White. Fully lined,longer length dress. 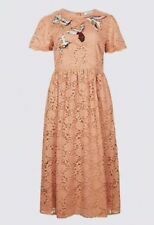 PER UNA Ladies Size 12 Coral Lace Crochet Back Blouse Top Cotton Blend. Condition is Used. Dispatched with Royal Mail 2nd Class. Condition is used but only worn once! A-LINE STYLE SHAPE. PINNED TO FIT MANNEQUIN. SIDE AND BACK POCKETS. 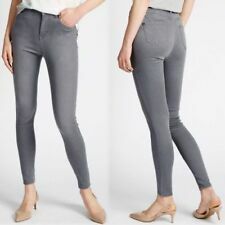 Ladies Per Una Grey Stretch Cropped Summer Trousers Size 18. In Excellent Pre-owned Condition! 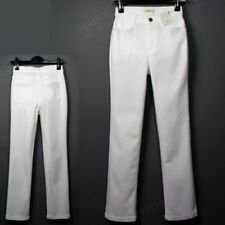 98% Cotton 2% Elastine Inside Leg: 21" approx Please see my other Quality items. SIZE 16 PER UNA SKIRT FINE VELVET CORD STRETCHY FRONT BUTTON/ZIP KNEE LENGTH. Condition is Used. Dispatched with Royal Mail 2nd Class. Dark Blue - I bought two pairs and wore the life out of one pair so I know how comfortable they are to wear. Per una denim skirt 20. Good Condition. Selling due to weight loss. Dispatched with Royal Mail 1st Class Letter. 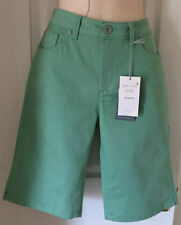 Ladies Trousers - Per Una - Size 14r. Condition is Used. pale blue cotton / viscose fly front, zip and button two mock pockets at front length - waist to hem 94cm approx waist - seam to seam 44cm approx two mock rear pockets belt loops Dispatched with Royal Mail 2nd Class. BNWT Ladies Per Una Pink Linen Blend Summer Skirt Size UK 12 Boho? It is a pink mix subtle stripe and is a linen and viscose mix with a 100% cotton lining. It has size zip fastening and is very full and flippy, nice festival skirt. M&S Per Una ladies jeans in dark blue. Subtle sparkle detail around the pockets. UK Size 16. Used - has a few small snags but otherwise good condition. Ladies Purple and Multi Stretch Top Size 18 By Per Una . Condition is Used. Dispatched with Royal Mail 2nd Class. Stretch material. Excellent condition. Nice lace on back of neck. See through. Great buy never worn button detail on sleeve as photo. Ladies white Linen Blend Sleeveless Top Size 12 By Per Una . Condition is Used. Dispatched with Royal Mail 2nd Class. Lovely condition. Side zip. Lined. Per Una Long Sleeve Tunic Size 10. Dispatched with Royal Mail 2nd Class. Pair Per Una 3/4 Length Trousers 16, Pink And White. Condition is Used. Dispatched with Royal Mail 2nd Class. White pair missing 1 button at rear. Have 3% elastase so some stretch in material, flattering fit. Per Una Ladies Top Size 22. Condition is Used. Dispatched with Royal Mail 2nd Class. Summer top with blue lace trim comes from a pet free, smoke free home. THE MAIN PART OF THE JUMPER ALSO HAS BLUE CHAMBRAY BELOW THE HEMLINE. LONG SLEEVES WITH RED SLIT CUFF AND BLUE CHAMBRAY CUFF HANGING BELOW. BLUE AND WHITE STRIPED WITH A BLUE SPARKLY STRIPE. Vgc black embossed stretch trousers. Per Una Cropped Grey Denims Size 10 New. Dispatched with Royal Mail 1st Class.